Yet again, I'm late to the party. 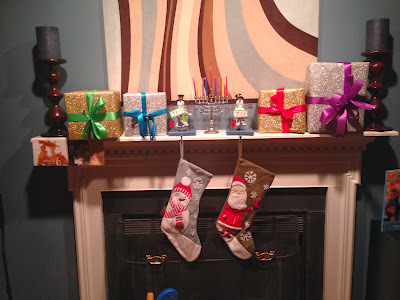 Thanksgiving, Hanukkah and Christmas flew by this year and I'm finally getting this post up! 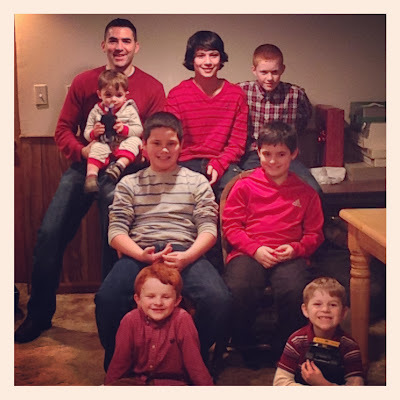 My brothers family came up from Maryland and the boys had the best time. 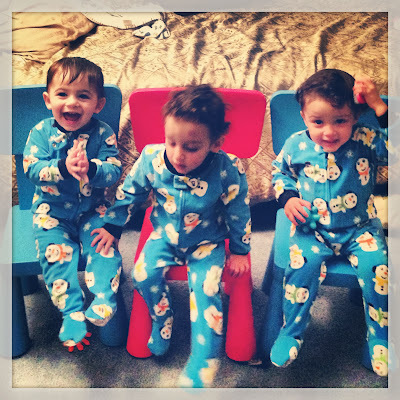 Dylan loves being around his cousins- they are 5 months apart! Dylan also LOVED helping us and watching us cook. We constantly turned on the oven light so he could see what was going on! We made Brined Turkey with a Delicious Gravy. I ended up not making the Maple Butter Gravy but my Gravy was still delicious! Our first course was Leek and Butternut Squash Soup. It was so tasty! Brussel Sprouts with Pomegranates and Pancetta is always a favorite at my house. And of course I can't have Thanksgiving without Kale and Butternut Squash Bread Pudding. The six of us finished this right up! We also had a traditional Sweet and Savory Stuffing that had sausage, craisins and all the basics. My delicious plate of food! We timed Thanksgiving perfectly with nap time. All three boys took 2 + hour naps while we enjoyed an early 'dinner.' 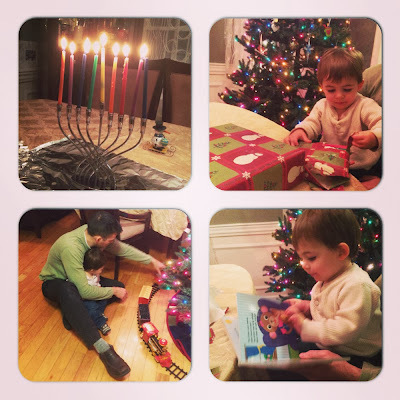 After they woke up more play time ensued, including getting some Hanukkah gifts! There was a joint bath time and a joint story time and then the boys all tuckered out for the night. We went to the Farm before my brothers family left and even in the 20 degree weather, all three boys had a blast! Hanukkah was fun for all the boys. They really got into opening their presents. We don't do anything formally- no 8 days of lighting and 8 gifts. When the family is together we open gifts and light candles and my mom makes a delicious meal, but otherwise we are very casual with Hanukkah. We want it to be part of Dylan's life, but it's not the only holiday he celebrates. 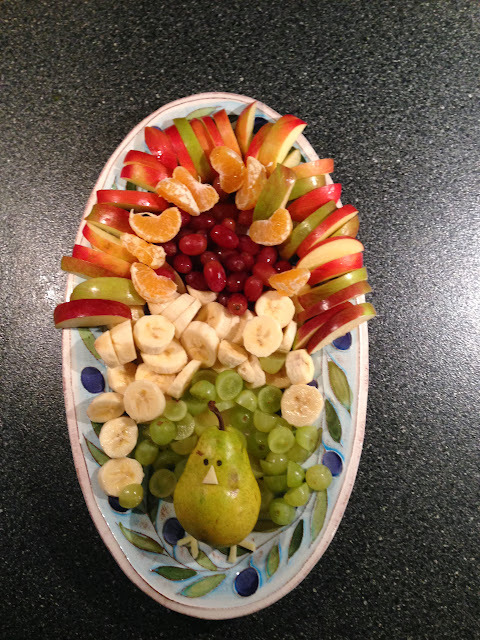 I also had a big playdate with a bunch of our friends before Mike left, and I made this festive Fruit Turkey! At home we set up our Christmas Tree. I grew up without one so I always loved colored lights. 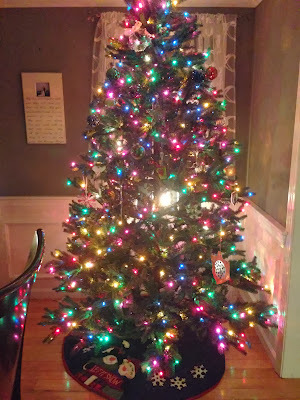 It seems white lights are more popular these days, but I just love how festive the tree looks with colors! We also set up a train around the tree and Dylan was obsessed with that. 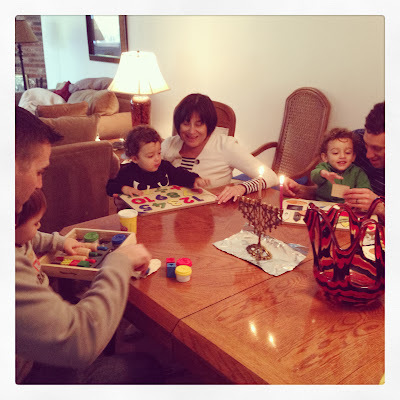 And we brought out our own Menorah just in time for the last night so Dylan got to light the candles and get a present at home as well. Christmas Eve we headed up to my in-laws and then later to Dave's Aunts house. Dyl fell asleep on the way home and woke up Christmas Day like any other morning. He isn't quite old enough to grasp the significance of it. We ate our normal breakfast and then dived into some presents. Dyl definitely enjoyed opening gifts! BUT, he wanted to play with EVERY toy as he opened them. I think next year I will take them out of the packaging! In the afternoon, we headed to the in-laws and had a great day celebrating! I'm pregnant and we're having another baby boy in early June! I'm currently 20 weeks and finally feeling like myself again, albeit, quite large!